Copyright © 2013 [Performance Hydroblasting, Inc.]. All rights reserved. Waterblasting offers the greatest potential for preserving pavement integrity while completely removing pavement markings. Performance Hydroblasting, Inc. is an industry leader in removal technology. Our customers are experiencing the highest standards achievable. We have customized our tooling and equipment to enhance these results, even in the toughest site conditions. Occasionally we hear of waterblasting performed by others that did not achieve the desired goals. This article should help you achieve your goals through a better understanding of the process and how to best integrate waterblasting into your construction phases. The project engineer influences the waterblasting results in ways that are not always obvious. The project engineer is concerned with, not only quality, but also with such factors as weather, resealing, repainting, coordination with other trades, closure restrictions, and deadlines. The optimal results of waterblasting become most consistent in the presence of careful consideration of these external influencers. This is largely the phenomena of the project engineer's engagement in a continuing education in best practices for a rapidly evolving technology. Our job is to eradicate the markings without scarring the pavement. This is one of the key benefits of our optimized waterblast tooling. Grinding methods are obsolete now because our waterblast tooling can achieve incredibly high standards of removal without compromising the pavement. 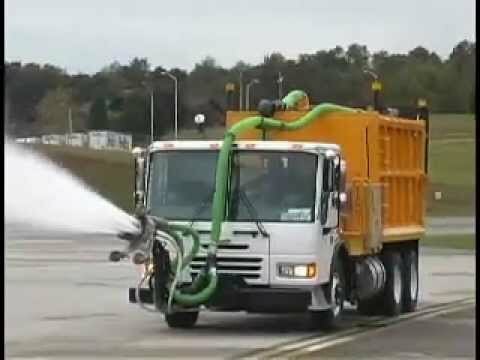 Low Impact Pavement Marking Removal"
20,000 PSI RUNWAY RUBBER REMOVAL?